I had a magical evening hanging out under a lighthouse last night. Thats right, a lighthouse. I walked along the beach and out onto a dock and sat under a lighthouse and the stars and stared out at Lake Michigan and the beautiful Chicago skyline. I felt like I was on an island. After my lighthouse meditation I walked to a nearby cafe. It was reminiscent of a beachside hangout somewhere in the Caribbean. I sat on the patio and listened to some blue grass tunes. A couple women were wailng away on their guitars. I was told that Janis Joplin had played at the cafe in the 1960’s. I’ve decided to continue my nautical theme today. I havent seen the ocean since last summer in LA and who knows when I will see it again. Ive already requested Mermaid Pose for Diana’s class at Tula today. I plan on leading a wild underwater adventure in my Family class at 11:30am. And I’m thinking dolphin and fish pose for my Tula Vinyasa class at 12:30pm. Why not? 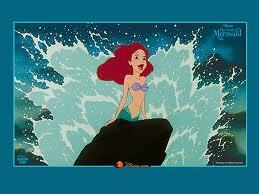 i love the pic of ariel! maybe instead of up-dog, we should say up-mermaid!